These are our DVDs. If you are interested ask for a copy and we will forward it to you. Price: 16 € + mailing costs. Please contact associacio@arca-bus.org for more info. The last Pegaso 6035-A from the UAB. More than 40 min of footage at peak hour, with several units of Pegaso 6035-A running simultaneously, together with other models belonging to the UAB. Filmation from both inside and outside of the whole circuit around the UAB's Campus on board of UAB 13 (ex-TB 2004/3004), the oldest Pegaso 6035A at present. 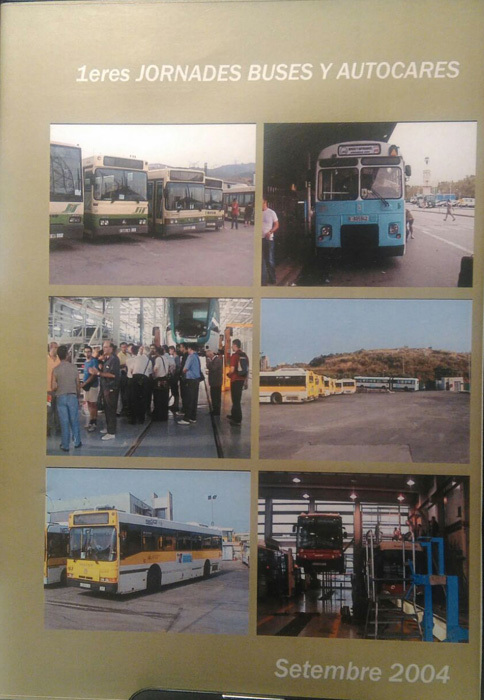 Narration in Spanish of the history and technical details of the buses. 20 minutes of additional footage (totalling 60 min) explaining the works carried out to restore our bus. Duration. 41 minutes + 20 minutes of extra footing. 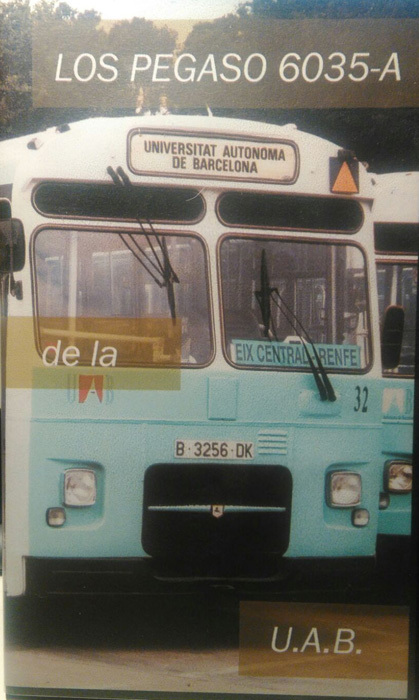 The Pegaso 6420 has been the last Pegaso model working at the city of Barcelona. With their withdrawal a long relationship going back to the end of the 50s comes to an end, when the first Pegaso engined Chaussons were purchased by TMB. This documentary shows you many details from the interior of a Pegaso 6420. The video starts at the bus depot while the bus gets ready for the last trip. 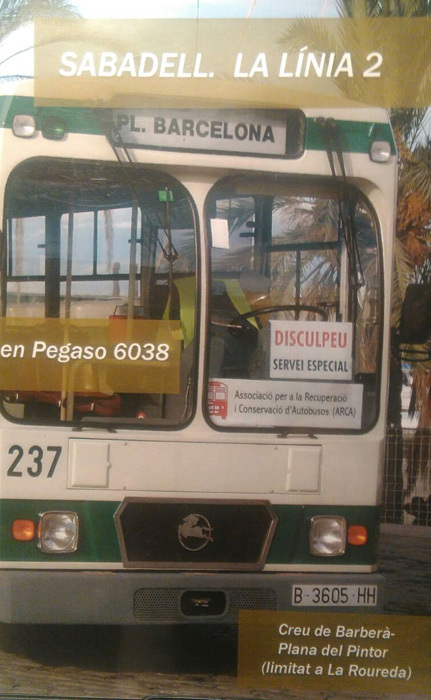 You can also see other withdrawn Pegaso vehicles used for different purposes at the city and a summary report of the last journey on 10th September 2005. 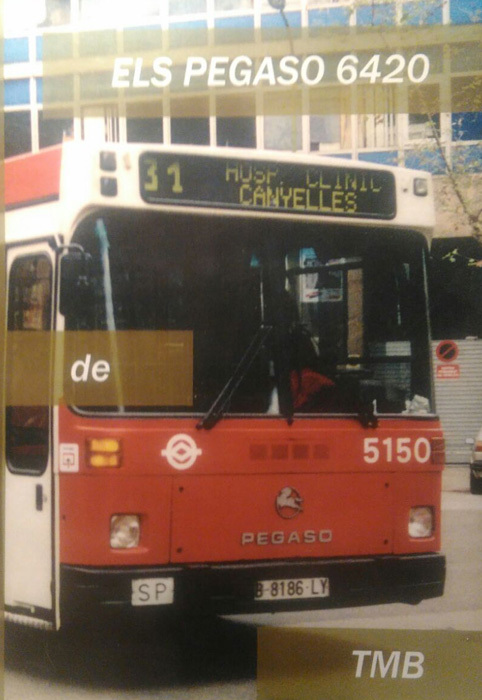 Contents: During year 1995 the last units of Pegaso 6035 disappeared from Barcelona's streets, after almost three decades of service with different operators of the city. 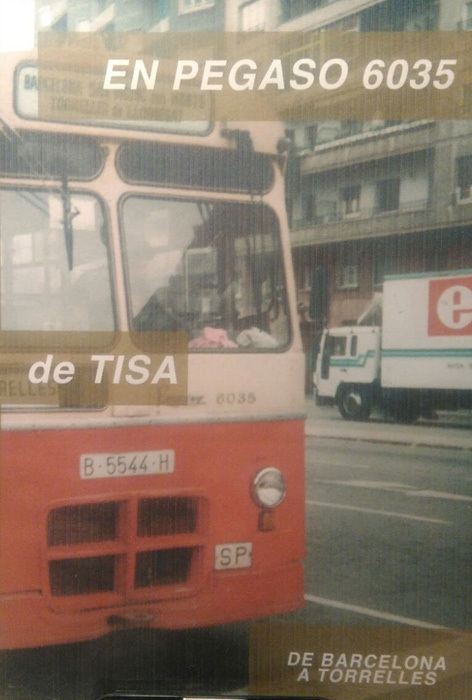 The last surviving units were those belonging to TISA and Rué. This film was shooted shortly before both bus and operator ceased service. It includes a return trip shot from the driver's position. Photos of vehicles that were in service on the route from Barcelona to Torrelles are also offered. 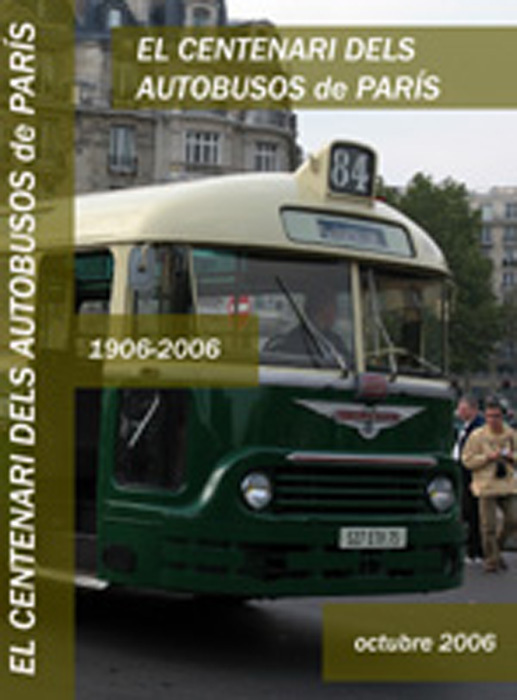 Contents: During October 2006 Paris celebrated its first 100 years of bus service. A big bus parade through the city centre streets allowed the public to see the a variety of bus models that gave service during the last 100 years, ranging from the 1906 Brillié Schneider to more emblematic models such as the Chausson APU, the elegant Somua OP5, or the classic TN from the thirties. This shooting lets you not only see the vehicles in motion but also you can hear their noises. A report about the static exhibition at Parc de la Villette is also included, as well as shootings made in the subway, the three tramway lines and a summary with images of present-day buses. Summing up, this dvd offers a complete and updated overview of public transport in Paris. Contents: The city of Sabadell (Barcelona, Spain) possesses a urban bus network consisting of 12 routes. Route 2 crosses the city straight from north to south, beginning at the Avinguda Barberà, going past the city center (the famous Rambla) and ending up north around the Avinguda Matadepera. This video follows the itinerary on board of historic vehicle: the Pegaso 6038 ex-TUS nº 237, withdrawn from service during year 2003 and preserved since then by the bus fan Joaquín Canales, who restored it to the original livery, keeping it in perfect working order. The shooting is a combination of both exterior and driver's view images. Production: Miguel Atencia, Antoni Julià, Antonio Gª Calderón, Joaquín Canales, Lluís Cuesta, Marcel Estadella y Manel Diaz. Production: Marcel Estadella and Manel Diaz.